Canggu is a cool, cafe, surf, beach bar area of Bali, just 30 minutes from Seminyak. It’s almost a secret, so if you want to experience it before the vacation world takes it over and fills it with shops and restaurants, go now! We were enticed back to Bali sort of by accident. It had only been 7 months since we’d visited, and didn’t expect to return so soon. A travel deal presented itself though, and the lure of warm weather, happy people, and cheap food and drinks hooked us in. We convinced ourselves that exploring this new area of Bali made up for not choosing to spend our travel dollars in a place we haven’t yet experienced. And we were certainly rewarded by our time in Canggu. We describe Canggu as a laid-back surfy village, filled with gorgeous 18-28 years old travellers (amongst other gorgeous people), many who are staying for months rather than days, soaking up the sun, and riding the waves. 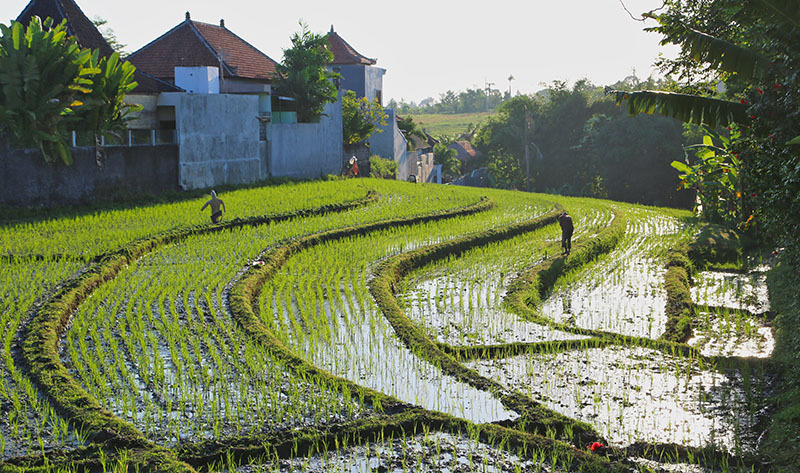 The Balinese here are friendly, and looking to capitalise on this emerging travel market. Everyone seems to be winning from the arrangement. It’s a mix of surf, rice fields, and local living, and young travelers are keen to enjoy it. A number of casual cafes and restaurants have established alongside existing and friendly local warungs, and along the beachfront, with the exception of the extravagant and extroverted Finn’s Beach Club (technically in North Kuta), the bars are casual, relaxed and not overly pricey. Large resorts are being built, but you can stay super-cheaply at a homestay if you want to really get into the culture, or many smaller villas like we did. Our accommodation was the boutique Planta Villas. About the beaches. They’re really for watching the sunset and surfing. The sand is black, and you have to dodge the odd dog poo from one of the many owned or stray dogs, all friendly, that wander the beaches. But if you want a cool community of international young travellers to have a quick morning surf with, and to feel the wind sail through you as you ride around on a motorbike, then drink a health smoothie or coconut, fresh and warm from the nut, while eating a bowl of the best green salad or gado gado, and follow the day up with a few coctkails or bintangs to watch the sunset, then repeat……this is the place for you. And I forgot to mention the massages….! We hired a scooter and 2 helmets from our resort for $10 a day. You could get them for around $6 a day in town, but we really didn’t mind paying the extra and getting it delivered to us and returned for us when we were finished. We did however have to get petrol right away as the tank was empty. 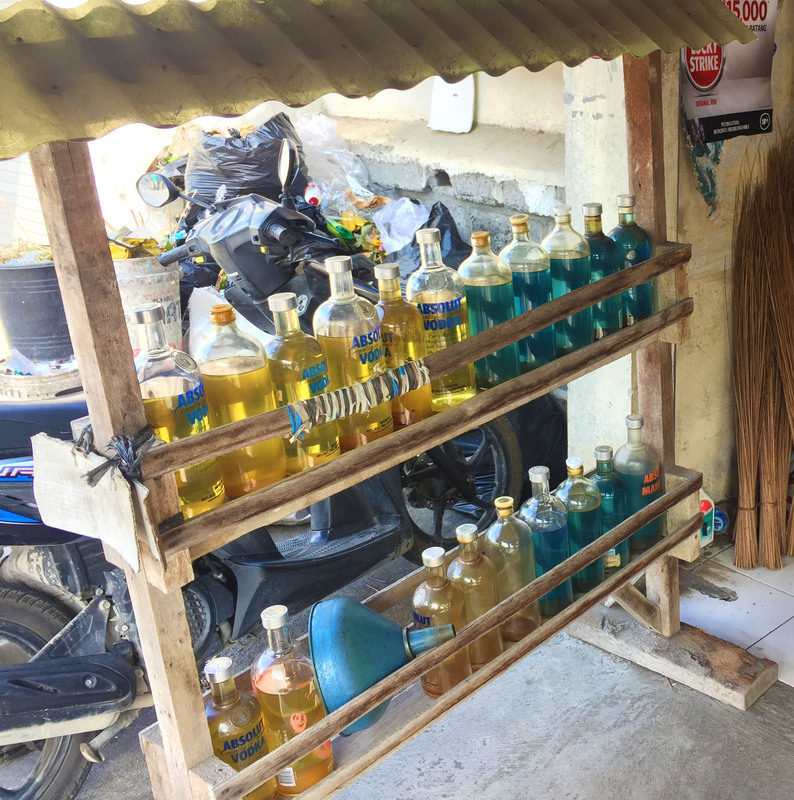 Here’s a funny thing about Bali, petrol is sold everywhere along the little roads, in bottles. Glass bottles mostly, but we have seen it sold in plastic bottles. We pulled in at a little dirty looking place (they all look like this) and without us speaking a common language, the older Balinese man chose a bottle for us, whipped out his funnel and poured it into our bike. He gave us a bottle of blue fluid, and others gave us yellow. It didn’t seem to matter which. Riding around was a little hairy – there are a lot of pot holes to avoid, and traffic pulling out onto the roads or cars roaring past, plus pedestrians walking along the road where there were no footpaths. But we stayed alert, and got through without incident. Hot tip: Wear a helmet. You don’t have to wear one in Bali, and many locals and visitors don’t. But the constant stories of foreigners dying from scooter accidents should be warning enough for anyone riding over there. Yes it’s cool to feel the wind in your hair, but don’t do it on the roads. We spent our days exploring by bike, or walking from one beach to the next. Finding coffee was always high on our agenda each day and we tested a few. We enjoyed The Shady Shack for its coffee and food. Very trendy little place though, and can take some time to snare a table. The service at Deus Ex Machina was pretty bad when we went, and we didn’t think much of the coffee either, but the place is kind of cool to visit and comes alive at night. Old Man Fridays and Captain Catch were laid back bars on the beach (along with The Lawn) where you could catch the sunset and have a couple of drinks at the end of the day. There was something that appealed to us much more about these more basic, less pizazz places than the new places with plenty of money injected into their fit-outs. I guess because we get those higher end places in Sydney, and we were looking for the more authentic, make-do side of Bali that we love. One thing to note about getting about in Canggu – it’s is a big area, and although you can walk from area to area along the beaches, it’s often very hot to do so during the day. So getting around on a scooter or hiring a driver are the best options. We found what we refer to as “the path of certain death” going from our area of Echo Beach in search of Finn’s Beach Club, just out of Canggu, in North Kuta. There is an inroad (path) that connects the two areas but our advice is – don’t take it, especially if you are on a scooter. It’s doable, we know, we did it on a scooter and in a car, but it was pretty scary. The road itself is made of bricks which are very uneven in many places, and is only wide enough for 1 car and 1 bike at a pinch (although it’s 2-ways) and the edges are concrete that drop straight into wet rice fields. Having a truck coming the other way had us balancing on the edge of bumpy ground. Not worth avoiding the main road in our opinion. 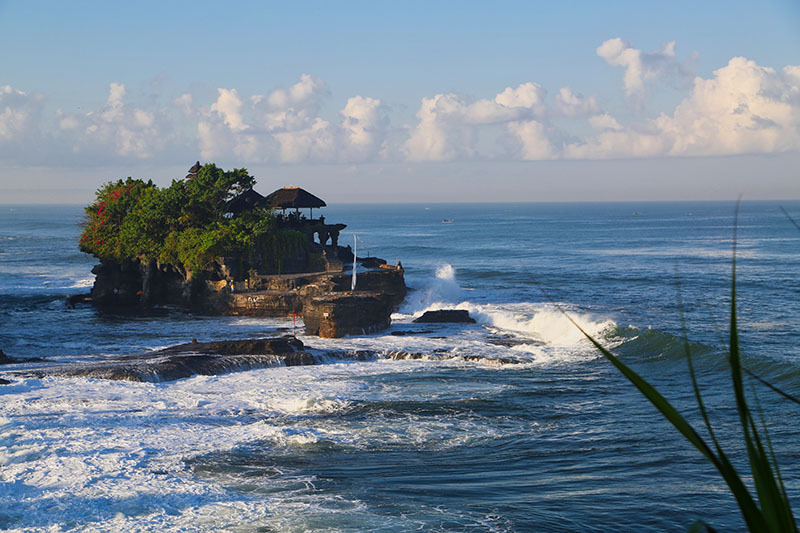 A big advantage of staying in Canggu is its proximity to Tanah Lot Temple. This is a beautiful temple on it’s own island just off the shore. In low tide you can walk to the base of it. Many people go there to see the sun setting behind the temple, and there are many, many restaurants and stalls set up for food and crafts and gifts. A full market in fact. However, we wanted to experience it in a more peaceful way so we rode the scooter there in the morning before the opening time. Hot tip: If you want to beat the crowds and have the famous Tanah Lot Temple all to yourself – go before 7am. We did this and had a fantastic time. We were early enough to even beat the ticket office, and got to look around for free. At that time there were just a few market stall owners setting up their stalls for the day, and some friendly dogs looking for a bit of love and a walking companion. 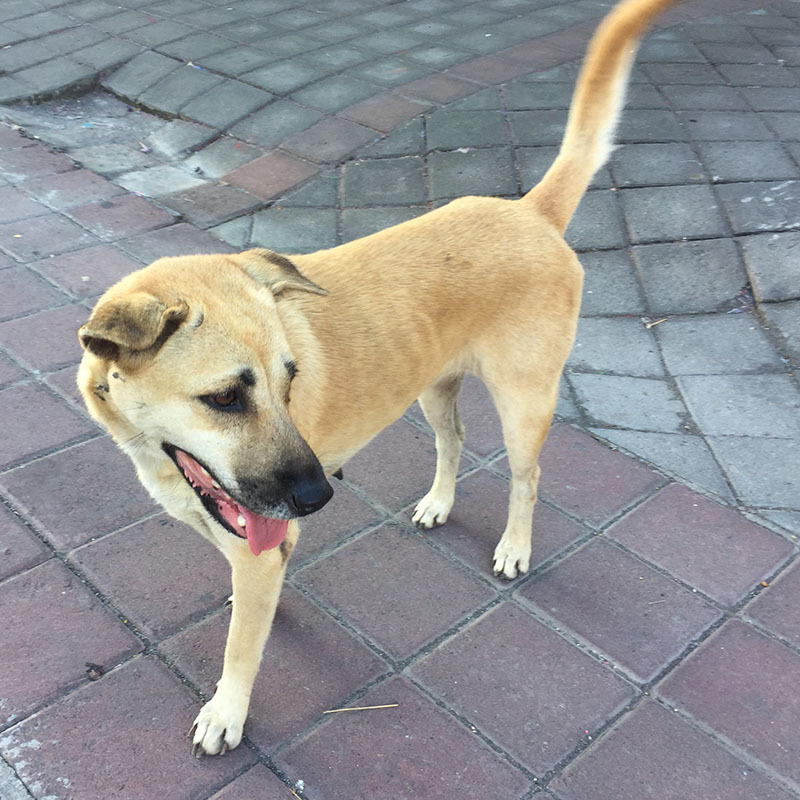 We met this girl who spent her time with us while we were there. Love her! Canggu has given us another perspective of Bali and this time we really felt the unique flow of life on this peaceful island. Sometimes it’s crazy and hectic like the traffic, but it moves through and together, seamlessly, and without anger, or question, or accident. There is a focus on just being, and we felt we understood the many travellers who were choosing to linger days, weeks, and months, finding their flow in Canggu.